UPDATE: TUESDAY, May 26—Earthquake relief efforts in Nepal are giving way to activities focused on rehabilitation projects that will ensure Heifer participants are in more stable shelters where they can securely store belongingings, including grains and other foodstuffs, and also escape the heavy monsoon rains. And the need is urgent. On Monday, Heifer Nepal's Country Director, Shubh Mahtato, said a huge landslide had blocked the Kali Gandaki river, which posed a threat of flooding to eight districts, six of which include Heifer project work. The water level had already risen 300 meters, but the dammed water founds its outlet about 16 hours later, and the river took its course. The river flow was heavier and some of the houses at the river bank flooded, but there was no substantial damage. "Though the potential risk has been minimized, the threat of landslide remains along the fragile mountains. We do anticipate a difficult monsoon this year and the public warned to be alert," Mahato said. One month after a devastating 7.8-magnitude earthquake shook the country, damage is still widespread. Until now, Heifer focused primarily on providing temporary housing materials including tents, tarps, foam mattress rolls and ropes and other supplies to approximately 21,500 families in 12 districts. Members of Heifer project Self-Help Groups and Cooperatives played a key role in immediate relief support before government or other assistance arrived, as well, ensuring distributions went smoothly and each family received some support. Now, because of the wide range of needs, Heifer Nepal has established a revolving fund for communities in four districts that saw the worst damage. This approach will allow the communities to identify the most immediate needs and make joint decisions about how to best distribute funds. The revolving fund will support pre-approved activities that will be co-created by Heifer and the community. The fund is interest-free for two years. Participants will begin to pay back the funds 12 months after the initial period, and all money will stay in the community to provide continuous support in the future. Cash flow in the communities will help boost the local economies, as well. Livestock needs are also a priority for Heifer, and we are working to secure funding to replace lost livestock, to rebuild animal shelters and to provide adequate food, fodder and water for livestock. You can help families in need of secure housing by donating to the Nepal Earthquake Relief and Recovery Fund. UPDATE: WEDNESDAY, May 13—Heifer Nepal staff believes another 28 villages could have sustained further damage from the second large earthquake that shook Nepal Tuesday, and assessments are underway to determine the extent of the damage. While the country has been experiencing a number of aftershocks since the initial April 25 earthquake, Tuesday's temblor was the largest in magnitude, registering 7.3 on the Richter scale. The quake had an epicenter northeast of the capital Kathmandu and was felt for miles. Heifer staff in the capital felt the tremors and said the shaking lasted about one minute. 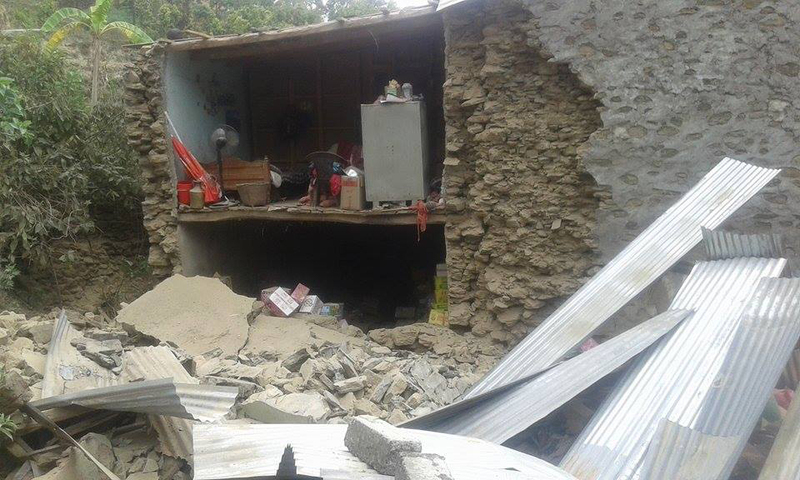 All staff are safe, but the Heifer Nepal office incurred some damage. The floors are buckling and plaster has come off the walls. An expert will be look into the integrity of the building today. In the wake of the initial earthquake, Heifer has provided relief materials including tents, tarps, foam mattress rolls, ropes, and other temporary housing supplies to 10,434 families in Dhading and Nuwakot districts. We will remain focused on providing these supplies to another 10,000 families in five more districts through the end of this week so that families will have shelter to last through the upcoming monsoon season that typically lasts from June through September. Going forward, Heifer will begin focusing on recovery and rehabilitation, including restocking animals that were lost, ensuring livestock have adequate shelter, food and water supplies, and that animals receive proper vaccinations and deworming so that families can regain their livelihoods. Please help these communities affected by the earthquake by donating to our Disaster Rehabilitation Fund so they can begin the long rebuilding process. UPDATE: TUESDAY, May 12—Another strong earthquake shook Nepal Tuesday, just a little more than two weeks after the magnitude 7.8 quake rattled the central Asian nation and devastated many areas where Heifer is implementing projects. The second quake, a 7.3-magnitude, had an epicenter to the north east of the capital of Kathmandu on the Chinese/Tibetan border. Heifer staff in the capital felt the tremors and said it lasted about one minute. All staff are safe. Heifer is working to assess how this most recent earthquake impacted our projects. We will be posting here as soon as we know. We have helped more than 10,000 families over the previous two weeks, and staff was in the process of providing relief supplies like tents, tarps, mattresses and other housing materials to another 10,000 affected by the April 25 quake. If you'd like to help the people of Nepal recover, please donate to our Disaster Rehabilitation Fund. UPDATE: WEDNESDAY, May 6—Heifer Nepal planned to distribute relief supplies to another 3,425 project families Thursday, and had scheduled additional deliveries for another 1,000 families later in the week. Distributions have taken place in the heavily affected districts of Dhading and Nuwakot, and additional assistance is being provided in Palpa district. By Saturday, Heifer Nepal staff is estimating they will have provided more than 10,000 project families with temporary housing supplies like tents, blankets, ropes, mattress pads and other relief materials. Nepal Earthquake Relief | Heifer International from Heifer International on Vimeo. Heifer Nepal staff captured this footage while delivering relief supplies to villages in Dhading. You can help our project participants recover from this deadly earthquake by donating to our Disaster Rehabilitation Fund. Our staff have been working closely with the district disaster relief committees and other government agencies overseeing the earthquake relief work to ensure they are able to get supplies out of Kathmandu and to our communities in need. They have also partnered with Lions Club and other agencies to provide food and water. While on these deliveries, staff has found more people and more damage than initially thought. Neena Joshi, the director of programs for Heifer Nepal, said it appears that people are returning to be with family in the rural areas from Kathmandu after the earthquake caused so much destruction. Because of this, Heifer Nepal is also providing aid to families not involved in our projects. At least 7,100 project participant homes across 12 districts have collapsed while another 3,000 of our families' homes have sustained major damage. Heifer families also lost at least 1,500 animals in the quake. UPDATE: MONDAY, May 4—More than 4,000 Heifer project families have received temporary housing materials and other relief supplies and another 5,000 families will receive the aid by the end of the week, Heifer Nepal staff said Monday. Five trucks loaded with relief materials head to Nuwakot district. Families there received temporary housing materials and other aid. Staff on Sunday distributed 2,300 tents, 4,000 blankets and 105 rolls of mattresses to 470 families in Panchakanya, Nuwakot; 1,300 families in Tupche, Nuwakot; and 750 families in Mulpani, Dhading. The staff said these distributions went smoothly, despite there being more people awaiting aid than originally expected. "In all the villages the number of families has gone up very much," said Neena Joshi, the director of programs for Heifer Nepal. Joshi said it appears that people are returning to be with family in the rural areas from Kathmandu after the earthquake caused so much destruction. "We expect this to be the same in all the villages we visit. The numbers there will exceed the numbers reported," she said. Distributions started with project families first, Joshi said. After the supplies for families were given out, staff had to figure out the best way to distribute what was left over. It was not an easy task, as the number of supplies was less than the number of families waiting, she said. "There is no way we could exclude families," Joshi said. "We explained that we could not meet everyone's need; that the numbers there were larger than the numbers we had," Joshi said. "We tried to figure out a way to evaluate who needed the support most." Ultimately, Joshi and the team enlisted the support of the local army camp to distribute the leftover materials to the families who had the least. Overall, Joshi said people were satisfied and thankful for the aid, she said. The work will continue with the incoming materials, and in the meantime, the team will assess what other kinds of supplies our project families will need in the short-term before we switch over to providing long-term support. Heifer staffers stock mattresses, blankets, sheets and tents for people needing a place to sleep. A temporary shelter is seen in Dhading. The baby in the background was rescued from a collapsed house. All that is left of a collapsed home in Dhading. Heifer is distributing, among other items, plastic sheets to help protect families from the elements. A few Heifer goats in Dhading. Heifer Nepal staff distributed tents, tarps and other housing materials in Dhading district. A woman carries blankets, tarps and foam mattress rolls away from a distribution point in Dhading district. A woman accepts temporary housing supplies in Dhading district. A woman stands in front of her home that collapsed in the quake. Staff take names and inventories during distribution of relief materials in Dhading district. Heifer staff explain how the distribution process will unfold. People in Dhading district listen to instructions on how to receive relief supplies. A man carries his supplies. Staff and volunteers unload materials for distribution. Trucks loaded with relief supplies make their way to Nuwakot district Sunday, May 3. Heifer staff and volunteers load trucks May 2 to be taken to three villages affected by the earthquake. Drinking water facilities were damaged in the village of Tupche where Heifer delivered supplies Sunday, May 3. Women and girls work to clear the rubble in Tupche village, Nuwakot district, Sunday, May 3. Photos from the Nepal earthquake in April 2015. UPDATE: SUNDAY, May 3—Ten trucks loaded with relief supplies made their way from Kathmandu to three affected Heifer project areas in Dhading and Nuwakot districts Sunday, Heifer Nepal country director Shubh Mahato said. Staff were delivering 2,270 tents, 4,000 blankets and 105 rolls of mattresses to more than 2,500 Heifer project families in three different villages, Mahato said. The supplies were distributed to 470 families in Panchakanya, Nuwakot; 1,300 families in Tupche, Nuwakot; and 750 families in Mulpani, Dhading. The staff had received new rounds of supplies Friday and Saturday. In addition to the materials loaded and delivered Sunday, the Nepal team received an additional 1,716 tents, 1,481 blankets, and 57 rolls of mattresses that were being readied and will ship out later in the week. The team was also working with a few other organizations to ensure food and other services were being delivered to project families and others in these districts where aid was slow to arrive. "We are collaborating with a Texas based Medical team of non-resident Nepalese who will be providing medical services while we provide support for temporary shelters," Mahato said. Your gift to our Disaster Rehabilitation Fund will support these communities through this crisis and help them rebuild tomorrow. Heifer Nepal staff said earlier this week that the distribution has been challenging, but Sunday's deliveries went smoothly. When they arrived in Dhading Thursday they were prepared to see significant damage, but agreed that the state of the people and the villages was even more dire than what had been reported. Because of that fact, the team is also reaching out to families who are not Heifer participants. Project partners, project participants and community leaders from Chhatredeurali—the first village assisted Thursday—have arranged their own transport to support the remaining families there. They will use Heifer’s documentation system for tracking the distribution of supplies. UPDATE: FRIDAY, May 1—Heifer Nepal staff was restocking and loading more temporary housing materials Friday and will be transporting the supplies to three areas in Nuwakot and Dhading districts where they will distribute them to earthquake-affected families over the weekend. Our staff has been working closely with the district disaster relief committees and other government agencies overseeing the earthquake relief work to ensure they are able to get supplies out of Kathmandu and to our communities in need. They were able to obtain permissions other organizations had not yet received for that work. Because of this, it appeared that Heifer was one of the first, if not the first, international nongovernmental organization into an area in Dhading on Thursday, where the first deliveries were made. Project participants and others not involved with Heifer in Chhatare Deurali received 550 blankets, 294 tarpaulin tents along mattress rolls, ropes and plastic sheeting. The team said they are expecting to receive another shipment of tents from across the country in the next day or two to up their total to 3,200. They expect to be able to transport about 2,500 of the tents by Sunday and are hoping to receive an order of 5,000 more in the near future. Heifer is working to ensure we are distributing high-quality tents as the monsoon season starts in June and lasts throught September. Heifer is working to provide food, water and temporary shelters for the families in Nuwakot, like the one above, who lost their homes and animals in the recent earthquake. Heifer Nepal staff relayed that the distribution has been challenging. When they arrived in Dhading they were prepared to see significant damage, but agreed that the state of the people and the villages was even more dire than what had been reported. Because of that fact, the team is also reaching out to families who are not Heifer participants. Going forward, the team has made plans to work in tandem with other organizations who are providing food. Our focus is on the housing materials now, as it was in shortest supply. UPDATE: THURSDAY, Noon—Relief supplies were distributed for a second day Thursday to Heifer project participants affected by the 7.8-magnitude earthquake that shook Nepal over the weekend. Project participants in Chhatare Deurali in Dhading district received 550 blankets, 294 tarpaulin tents along mattress rolls, ropes and plastic sheeting. Distribution of these materials started Wednesday, and staff were focused on getting larger stocks of those supplies in transit to those in need. Staff in Kathmandu were busy packaging 3,450 blankets, nearly 300 tents and tarps, and six large rolls of foam that were cut into individual strips for mattresses yesterday. At the office in Chitwan, staff prepared 28 tarps and tents and five rolls of foam for mattresses. A truck carrying 45 foam mattresses, five plastic rolls and 54 silpaulin plastic sheets was en route from Chitwan to Kathmandu as well. In neighboring India, Heifer staff was coordinating with other local organizations to donate and transport materials for the relief effot in Nepal. Help Heifer provide food, water and temporary shelter to the thousands of project participants impacted by the earthquake by giving to our Disaster Rehabilitation Fund. Staff were able to reach some affected areas Tuesday and found widespread damage. At least 6,300 project participant homes across 12 districts had collapsed while another 1,900 of our families' homes had sustained major damage. Heifer families also lost at least 1,500 animals. Heifer works with more than 50,000 farming families in the affected districts of Dhading, Nuwakot, Chitwan, Nawalparasi, Lamjung, Parbat, Baglung , Palpa, Kaski, Sinduli, Sarlahi and Tanahu. Nepal staff will remain in the areas for further assessments and to provide resources like temporary shelter materials, food and water. Our thoughts and prayers remain with the 63 farming families who have suffered a loss of a loved one, with our colleagues, and with all in Nepal who are working to assist these communities. UPDATE: WEDNESDAY, Noon—Heifer Nepal staff and volunteers began distributing relief supplies Wednesday to our project participants who lost their homes, livestock and family members in the 7.8-magnitude earthquake that struck Nepal Saturday, April 25. Staff gathered at Heifer Nepal's Kathmandu office to package 3,450 blankets, nearly 300 tents and tarps, and six large rolls of foam that were cut into individual strips for mattresses. At the office in Chitwan, staff prepared 28 tarps and tents and five rolls of foam for mattresses. A truck carrying 45 foam mattresses, five plastic rolls and 54 silpaulin plastic sheets was en route from Chitwan to Kathmandu as well. 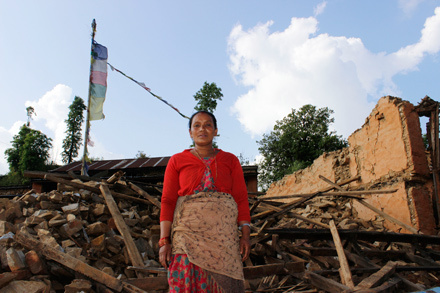 A woman stands in front of her home that collapsed in the April 25 earthquake that struck Nepal. Heifer Nepal has also placed an order for a further 500 silpaulin sheets, 3,000 tarps and 50 mattress rolls, and Heifer India is helping coordinate relief supplies to send to Nepal. Heifer planned to first provide assistance in Dhading and Nuwakot districts where damage was worst and will then move into other districts. Getting relief supplies like food, water and temporary housing materials to the rural areas where we work has proved one of the most difficult aspects of the relief effort. Staff were able to reach some affected areas Tuesday and found widespread damage. At least 6,300 project participant homes across 12 districts had collapsed while another 1,900 of our families' homes had sustained major damage. Heifer families also lost at least 1,500 animals. The numbers are expected to rise. Though Heifer's work focuses on long-term development and sustainability, our focus now is the immediate needs of Nepalis affected. Heifer will also supplement the work of governments and relief agencies to distribute aid. Longer-term work will include rebuilding communities and providing livestock and related training. UPDATE: TUESDAY, Noon—Heifer International is saddened to report the deaths of at least 61 of our project participants due to the 7.8-magnitude earthquake that struck Nepal Saturday. The news confirmed what Heifer had feared since receiving word of the disaster. Staff who were able to make their way into the affected areas Tuesday found widespread damage. At least 6,300 project participant homes across 12 districts had collapsed while another 1,757 of our families' homes had sustained major damage. Heifer families also lost at least 1,500 animals. The numbers are expected to rise. Heifer works with more than 50,000 farming families in the affected districts of Dhading, Nuwakot, Chitwan, Nawalparasi, Lamjung, Parbat, Baglung , Palpa, Kaski, Sinduli, Sarlahi and Tanahu. Nepal staff will remain in the areas for further assessments and to begin providing temporary shelter, food and water for project communities in need. Heifer will first provide assistance in Dhading and Nuwakot where damage is worst and will then move into other districts. Longer-term work will include rebuilding communities and providing livestock and related training. The map of current projects in Nepal. Dhading and Nuwakot districts are highlighted in blue and are in Central Nepal. Your gift to our Disaster Rehabilitation Fund can make a big difference for the thousands of Heifer families impacted by the earthquake. Heifer is currently working with 171,000 farmers in 39 districts in Nepal to develop goat and dairy enterprises. By strengthening local production, Heifer is working to reduce imports of goats and milk into Nepal and enabling local farmers to develop income sources. Heifer has worked in Nepal since 1957 to reduce poverty and build sustainable family enterprises with animals like sheep, goats, ducks and water buffalo. The earthquake, which had an epicenter about 50-miles from the capital of Kathmandu, has caused significant damage, and the death toll has risen to more than 4,000. Though Heifer's work focuses on long-term development and sustainability, we will supplement the efforts of government and relief agencies with food, water and materials to help meet basic shelter needs. We will work to provide that relief as soon as possible. Our thoughts and prayers are with these families and with our colleagues who are working to assist these communities. UPDATE: SUNDAY, 1 p.m.—Heifer staff are trying to make their way to the affected project areas in Nepal one day after a 7.8-magnitude earthquake shook the small Asian nation, Heifer's Nepal Country Director reported Sunday. The teams' efforts were hampered by debris in roads, damaged and conjested telephone networks and a lack of electricity. People receive treatment at Trishuli Hospital in Nuwakot District. "We are still facing problems in reaching people from the interior/rural areas. Telephones are not working, electricity supply is still problematic," said Shubh Mahato, country director of Heifer Nepal. Mahato said that some information has come in from the districts where Heifer is implementing projects, but the specific impact to our project participants is not yet fully known due to the challenging conditions. Your gift to our Disaster Rehabilitation Fund can help us assist Heifer families impacted by the earthquake. Like we reported yesterday, it seems as though the worst damage is in the Dhading and Nuwakot districts where 80 percent and 90 percent of mud-and-brick households were either damaged or collapsed, respectively. District wide, our reports indicate that dozens of people have died along with hundreds of animals. We are also working to assess damage in nine other districts: Chitwan, Nawalparsi, Tanahun, Lamjung, Kaski, Parbat, Palpa, Sindhuli and Sarlahi. The quake had an epicenter about 50-miles from the capital of Kathmandu and has caused significant damage. Various news outlets are reporting that the death toll is now at more than 2,500. The situation could become more dire as storms were moving in to the affected areas. Many people are sleeping out-of-doors. A project participant's temporary shelter is seen in the heavily damaged district of Nuwakot. While Heifer is not a relief organization, we will supplement the efforts of government and relief agencies with food, water and materials to help meet basic shelter needs. We will work to provide that relief as soon as possible. UPDATE: SATURDAY 11:30 a.m— Heifer has received the first report from Nepal field staff on the effects of a 7.8-magnitude earthquake that shook Kathmandu and the surrounding districts where we are implementing projects. While there is a lack of specific information about the safety of families and any loss of animals due to damaged telephone networks, staff is expecting the damage in some districts to be severe. Shubh Mahato, country director of Heifer Nepal, sent a report about mid-day Saturday (about midnight in Nepal) that included information from seven of the 39 districts where Heifer has worked. So far, the worst damage seems to be in the Dhading and Nuwakot districts where 80 percent and 90 percent of mud-and-brick households were either damaged or collapsed, respectively. All staff was reported safe based on information received so far, said Padma Singh, senior director of Heifer’s Asia Programs. Help us assist Heifer families impacted by the earthquake by donating to our Disaster Rehabilitation Fund. Heifer is currently working with 171,000 farmers in Nepal to develop goat and dairy enterprises. By strengthening local production, Heifer is working to reduce imports of goats and milk into Nepal and enabling local farmers to develop income sources. Heifer has worked in Nepal since 1957 to reduce poverty and build sustainable family enterprises with animals like sheep, goats, ducks and water buffalo. The quake had an epicenter about 50-miles from the capital of Kathmandu and has caused significant damage. Various news outlets are reporting that the death toll is now at more than 1,000. While Heifer is not a relief organization, we work to supplement relief organizations’ support after natural disasters to help our farmers recover. We will be updating here with news of our projects as information comes in. A 7.8-magnitude earthquake that struck Nepal has impacted an area of Heifer International projects near the capital of Kathmandu, Heifer officials said Saturday. Heifer staff is working to assess safety of families as well as determine damage to homes and any loss of animals. All staff was reported safe based on information received so far, said Padma Singh, senior director of Heifer’s Asia Programs. Damaged telephone lines have disrupted communication. Heifer International is currently working with 171,000 farmers in Nepal to develop goat and dairy enterprises. By strengthening local production, Heifer is working to reduce imports of goats and milk into Nepal and enabling local farmers to develop income sources. Heifer has worked in Nepal since 1957 to reduce poverty and build sustainable family enterprises with animals like sheep, goats, ducks and water buffalo. Initial reports said the quake had an epicenter about 50-miles from Kathmandu and has caused significant damage. Between 700 and 900 are feared dead and thousands more have been injured. While Heifer is not a relief organization, we work to supplement relief organizations’ support after natural disasters to help our farmers recover. We will be updating here with news of our projects.